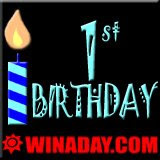 Slotland.com is celebrating the first birthday of their 3D online casino, WinADay.com. A year ago tomorrow the unique and unusual online casino site took its first real money wager. It’s been a busy year since WinADay began taking bets. Since then, four new games have been added to the original three one-of-a-kind slot machines and video poker games in the three-dimensional lobby, and there have been three six-figure progressive jackpot winners. To celebrate its first birthday, WinADay.com is giving a 10% to 30% bonus on all deposits during the birthday week plus another 20% on the actual birthday, June 23rd! After a big win just a few weeks ago, the WinADay.com progressive jackpot is currently over $75K. The $100, 224 (€73,970) win in May was the third six-figure jackpot at WinADay.com so far this year and the second to be won on the Wheeler Dealer slot machine. (Watch a report on the last win here: http://www.youtube.com/watch?v=FJZzawGO6kQ) In January, Monica68 won $148,724 (€116,200) while playing the same game. Then in March, “123jaki” won $159,660 (€123,620) on the single-payline Slot-O-Matic which had only just been launched. WinADay.com’s three-dimensional entrance and Games Lobby create a completely new experience for online casino players. Players are greeted and assisted by animated casino staff in the unique three-dimensional Games Lobby where they have seven one-of-a-kind, no-download, instant-play Flash games to choose from. All games are original and only available at WinADay.com, and they’re all tied to one progressive jackpot pool. The next new game will be a video poker slot machine. The unique 3D casino will also be adding a welcome video and video tutorials in the near future.